There are special scenes like when the fog freezes over and leaves everything covered with ice crystals or when it snows overnight and you wake up to a winter wonderland. 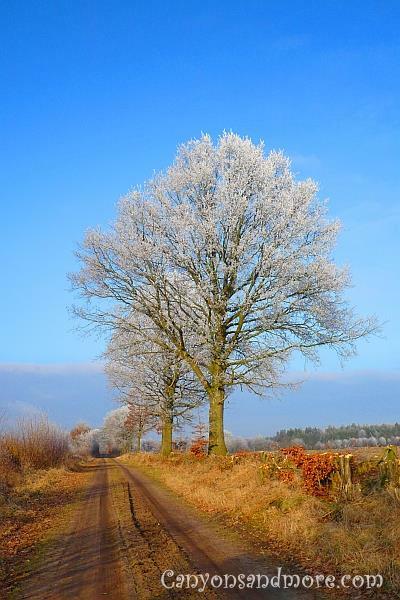 It is fun to bundle up and take long walks in the nature and enjoy the scenery. Winter can be such a beautiful season. 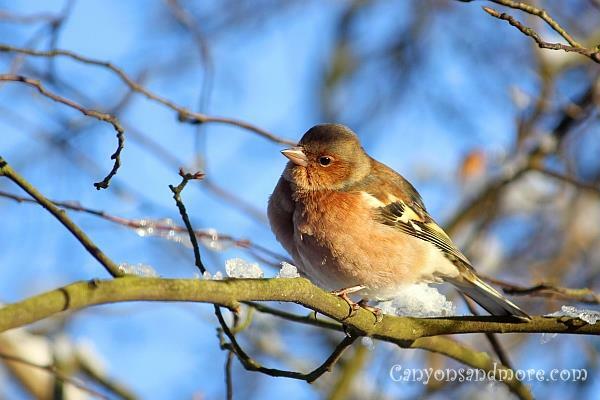 Especially when the snow has fallen and the sun is shining, it is worth going outdoors and seeing nature glisten and sparkle. 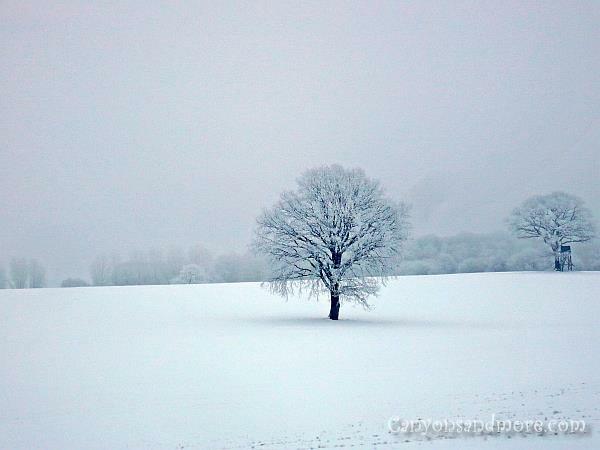 The image above captures a such a moment of winter and was made at northern area of Germany. 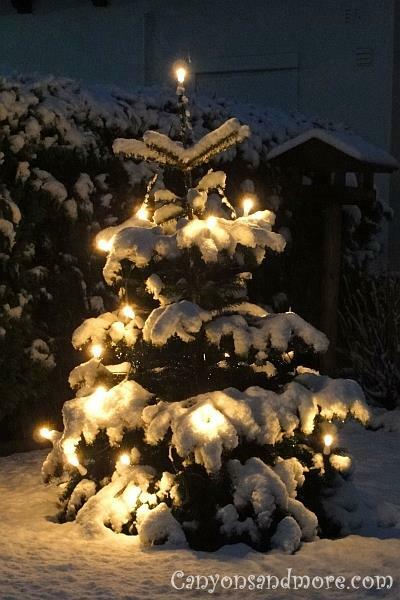 Even a few weeks after Christmas, you will find the outdoor trees still decorated with white lights. They light the way and make a pleasant atmosphere for a winter’s walk in the dark. Not only did it snow overnight and covered the landscape in a blanket of white, but it was also so cold that the snow froze over on the trees as well. There is something so quiet about a snowy winter’s day. 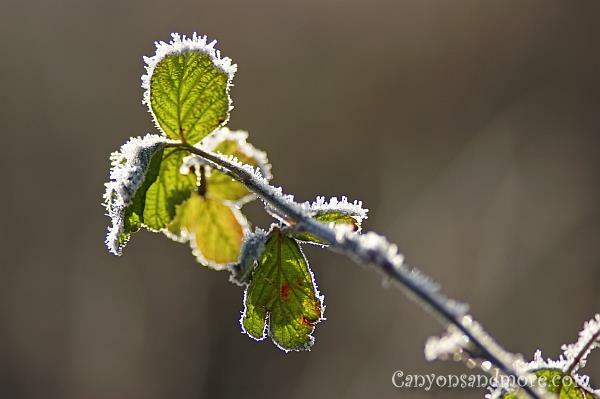 This was a sight to see as the sunlight highlighted the frozen crystals on these leaves and caused them to sparkle in the rays. 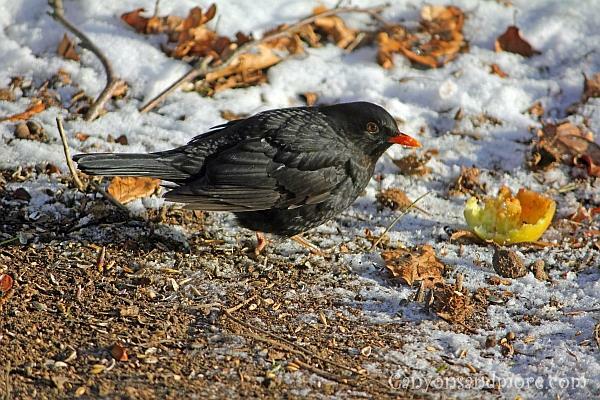 The blackbirds that remain here during winter also need some support when the ground is frozen with ice and snow. This area is full of the birds and it is often hard for them to find enough food when the winter is long and hard. They really love apples and we make sure to keep the birds supplied with them during icy weather. We cut the apples in half and place them outdoors with the core side facing up. They hungrily eat these apple halves leaving only the skin when finished. One night in winter, it was foggy and overnight the fog froze on the trees. It was an amazing sight the next morning. It was like someone shook a box of powdered sugar on the branches. 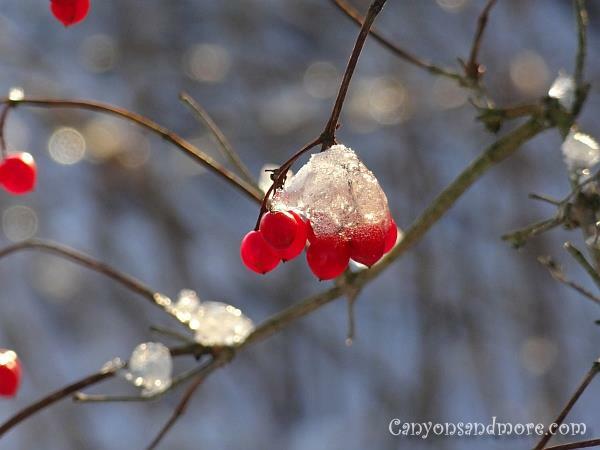 An overnight snowfall coated the leaves and berries on the shrubs and added a new grace to them. This elegance could be enjoyed only for a brief moment as the morning sun melted the snow within minutes. The weather was bitter cold but the sun was shining and this Chaffinch dame was sitting on a branch and soaking up a bit of warmth from the sun’s rays. When it is cold enough, the movement of the water cannot prevent that a stream will also freeze over. 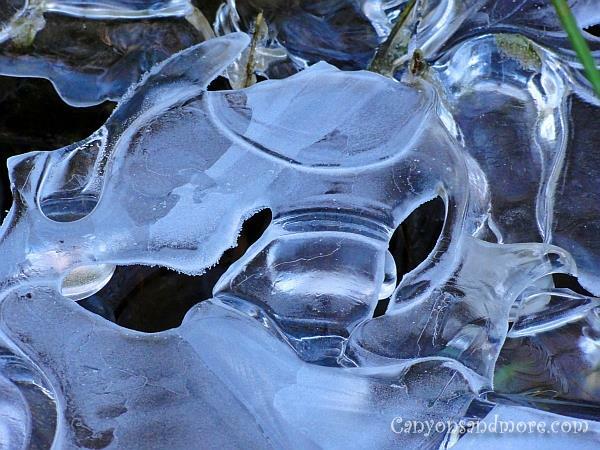 It is interesting to look at the bizarre formations in the ice. 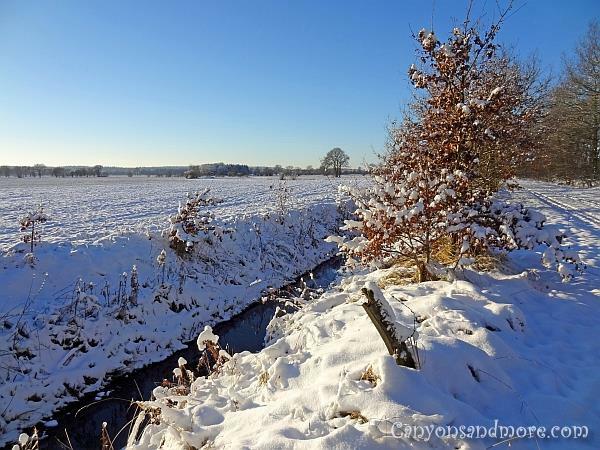 The most wonderful thing about winter is taking a walk in the cold and crisp outdoors and seeing how the snow transformed the landscape overnight into a winter paradise. This image was made on an early morning walk. The sun was just rising, giving the landscape a warm glow to it. 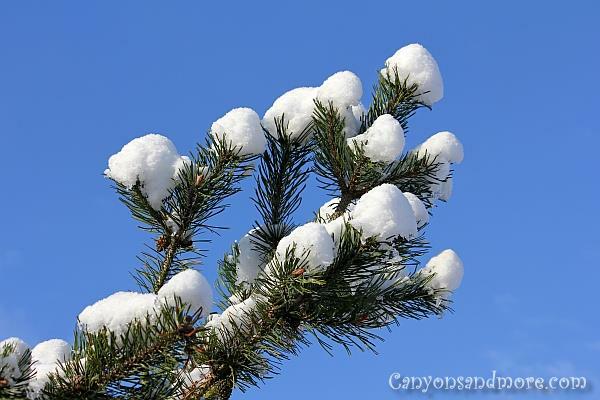 The snow that had settled on the tree branches almost looked like cotton balls.